Presidential hopeful Barack Obama and his campaign have just stepped on the third rail of black homophobia and gotten a jolt that has landed the candidate flat on his back. His campaign is sponsoring a gospel concert series in South Carolina called "Embrace the Change Tour," an important state in which to make headway with black voters. It features extremely popular recording artist and "former homosexual" Donnie McClurkin. The problem is that it appears that no one on Team Obama bothered to read up on the well-known homophobia of the recloseted singer, who demonizes gays and lesbians, comparing them to liars. McClurkin explains, "There are certain things like, you know, anybody who has a lying problem; they get to the point where they hate being so, having such a lack of character that they make a change." The gloves are off and if there's going to be a war, there's going to be a war. But it will be a war with a purpose. I'm not in the mood to play with those who are trying to kill our children. One of the things we've got to overcome is a stigma that still exists in our communities. We don't talk about this. We don't talk about it in schools. Sometimes we don't talk about it in churches. It has been an aspect sometimes of our homophobia that we don't address this issue as clearly as it needs to be. It should be noted that none of his fellow contenders for the White House have gone anywhere near this third rail, but in Obama's case, how soon we forget the magnitude of the problem. The decision by the Obama campaign to issue a mealy-mouthed statement condemning the singer's views -- but leaving McClurkin as part of the tour -- only revealed how fine a line the presidential candidate is walking between his LGBT supporters and the black religious voters he covets. My guess is that the political cost of throwing the LGBT community on the bus was considered a fair price to pay to pick up some votes in the Palmetto State -- the gamble being it would be far less likely to rise to a significant level of controversy in the mainstream media. For him to have asked McClurkin to withdraw would have set off a firestorm of bad press in the black media, which has conveniently failed to acknowledge that one can be both black and gay. Neither choice at this point is a good one. Placing the Obama situation aside for the moment, it's worth noting that some members of the black community are taking this bull by the horns. Last March I attended and live-blogged the National Black Justice Coalition's Second Annual Black Church Summit, which tackled this topic in a one-day forum. The NBJC is dedicated to empowering black lesbian, gay, bisexual and transgender people. One of the speakers was the Rev. Michael Eric Dyson. In the video below, he describes the success of the white evangelical movement in using homophobia in the black church to its advantage, and how churches should be wary of bedding down with a movement that otherwise wants nothing to do with black issues. 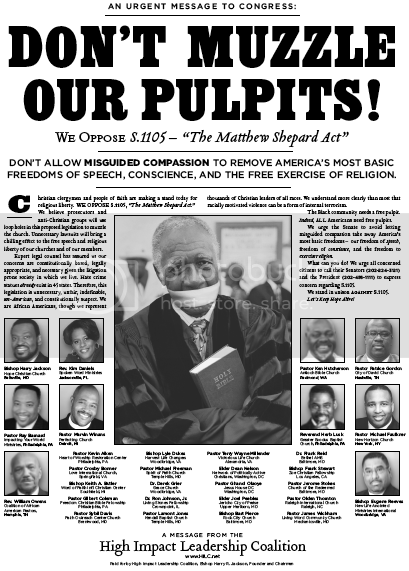 On behalf of the National Black Justice Coalition, I am writing to request a face-to-face meeting to discuss an urgent matter regarding your recent decision to continue to promote the Embrace The Courage Tour which headlines three of gospel music's most openly homophobic artists; the most volatile of which is the Rev. Donnie McClurkin. While we appreciate your recent statement reassuring the public that "... gays and lesbians are our brothers and sisters and should be provided the respect, dignity, and rights of all other citizens," we must also remind you that actions speak much louder than words. Your willingness to share a stage with Rev. Donnie McClurkin is alarming and frankly deeply disappointing. Rev. McClurkin has consistently disparaged gay men and lesbians, spread half truths and unproven theories about our lives and has shown a willingness to work with those who would use the rights of gay Americans as a wedge issue to divide black families for their own cynical political objectives. The fact that Rev. McClurkin uses his religious beliefs to justify bigotry and discrimination is so damaging that it cannot be addressed with a simple media statement no matter how heartfelt or sincere. As representatives of thousands of black LGBT families, hundreds of open and affirming congregations and parents, friends and neighbors we feel it is imperative that we meet with you directly as soon as possible to address the way forward to realizing a truly inclusive America. We look forward to hearing from you. How do I feel about homosexuality? I feel how God feels about it, but I still love them. I don't agree with the lifestyle, but I love them. They can come to the concert; I'm going to hug them just like I hug everybody else. They have issues and need someone to encourage them like everybody else -- just like the murderer, just like the one full of pride, just like the prostitute -- everybody needs God. What your struggle is may not be what my struggle is, but we all need Him. So, that's why our music is about giving and God, not to condone the lifestyle or to say, Oh it's okay, but not to bash -- but just to give them God. It's about praying away the gay to save souls, since gays are clearly more like a homicidal prostitute than your next-door neighbor. This is what Obama is up against. If he wants to present leadership and stimulate dialogue on this difficult topic, he wouldn't have to call for McClurkin's withdrawal; a better approach would be for the Illinois senator to actually attend the concerts, and give a short speech at each stop about how homophobia has no place at the concert, in churches or in the hearts of a people who have suffered mightily at the hands of those using religion-based bigotry.